hat_plays_sims | HAIR DUMP X PART THREE: Nobody Expects the HAT Dump! Okay, the thing with these is that you need to look at all the pictures first, because you get variations on the theme of baldness in this set. 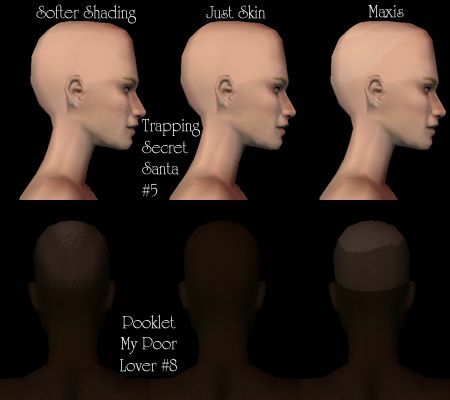 Multi-binned hair works like this: it shows up in all color bins in-game without needing four copies of the same bald hair and it doesn't trip ANY hair color chemistry flags, BUT it won't show up in Body Shop. The bald hairs with the writing on the back of the head DO trip chemistry flags AND hat flags, making them useful for accessories that cover the whole head (like In The Hood, which you'll see a bit later). It was something I needed, so I figured I'd share. 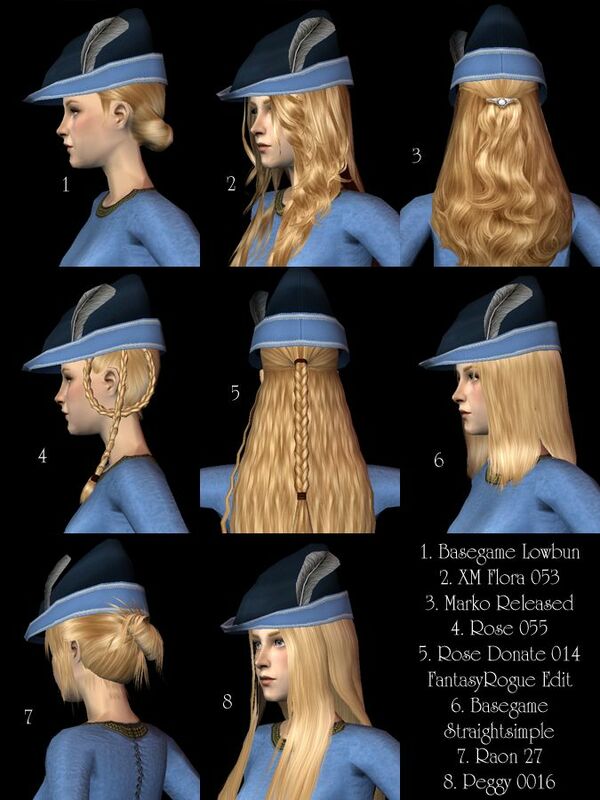 Yes, I HAVE done this hair before, but I did it pushing sliders around and without any shading. This one isn't textured quite the way I wanted it, but there are shadows and highlights and it's all done in assorted color actions, sorted light-to-dark. 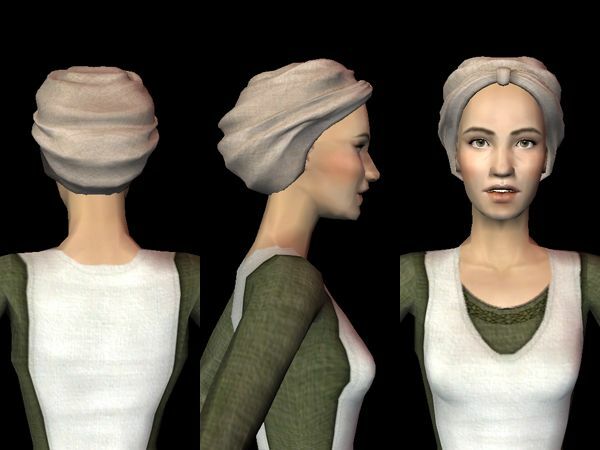 Although this is a fairly peasant-y headwrap, remember even ladies covered up their hair before bedtime, to protect their pillowcases, and the wealthier the woman, the whiter she could afford to get and keep her linens. As with all my hat hairs that show no hair at all, you can download this one in Custom (shows up in Body Shop) or Multi-binned (does not show up in Body Shop, but shows up in all hair color bins in the game). AN IMPORTANT NOTE is that you can only choose EITHER custom OR multi-binned; install both and you get multi-binned because last file loaded wins. Yeah, so usually I try to make sensible decisions about what color fabric goes with what color hair. This time I just kind of randommed my way through Project Mayhem naturals and Any Color You Like neutrals and slapped them together however they pleased me. None of these are bright white or even Time Bomb, because this is very much a peasant hair. This hair has been in a form of development hell for a long, long time. I really liked the original, but it wasn't animated and didn't fit the body all that well. Marja super-graciously fixed all that for me, then brought the high poly count to my attention. There was talk of doing a reduced poly version, but that mesh never materialized. If it does, I will cheerfully re-do this hair, but until then... I've done what I can. Use this one wisely. This is the first of three sets of accessory hats that ALL come in multiple parts, for ease of downloading. 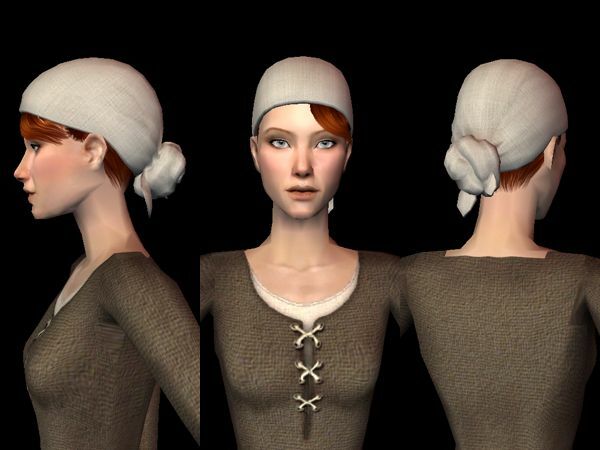 Okay, so, once upon a time, FantasyRogue made not only a crispinette accessory mesh for me, but a nifty braided-buns hairstyle to go with it. I vowed I would make like a million recolors of the crispinette... and now I've done it, just like I said I would. It just... took some time. These are the basics; gold, silver, and black with all veil variations, plus Dynamite and Time Bomb with pearls. You can download them either as glasses-binned accessories or as Bon Voyage jewelry. If you choose BV jewelry, know that I always bin crowns, hats, and helmets as eyebrow rings, and your Sim can only wear one eyebrow-ring item at a time. By the by, for all of these, I have to thank CuriousB; whenever a veil is bright white, it's Pooklet's Time Bomb, but when it's soft white, it's CuriousB's Milk. And then I started getting creative. The twenty shades of Aelia's Autumn color actions, using bits of trim from faric store sites and occasionally, real wirework posaments from silberknoten.de, which is an amazing site you should totally visit. 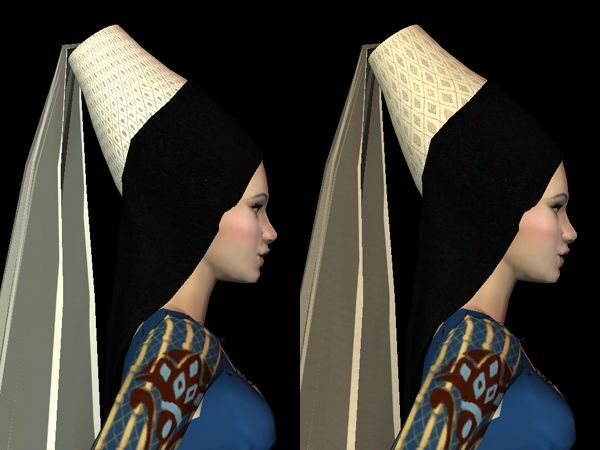 None of these crispinettes (and tressour crispinettes; those are the taller ones) are exactly peasant headgear, although some of the simpler ones could certainly be worn by someone in the middle classes or even a well-off freeman's wife for her formalwear. So... Yeah. You can get a lot of these, really. This one has even more simple recolors for your merchant's wives and your princess's nursemaids, but I'll be honest; more than once I let myself go absolutely crazy with the pearls. Some of these crispinettes have pearls at every intersection of the cauls (that's the bits on the sides). And they're bump mapped onto there. I'm not sorry. Not even a little bit. In an age when pretty much everybody was wearing clothes cut to the same pattern, a lady could make herself stand out with color (dyes were expensive, especially the rich, dark reds and true blues and saffron yellows) and trim. 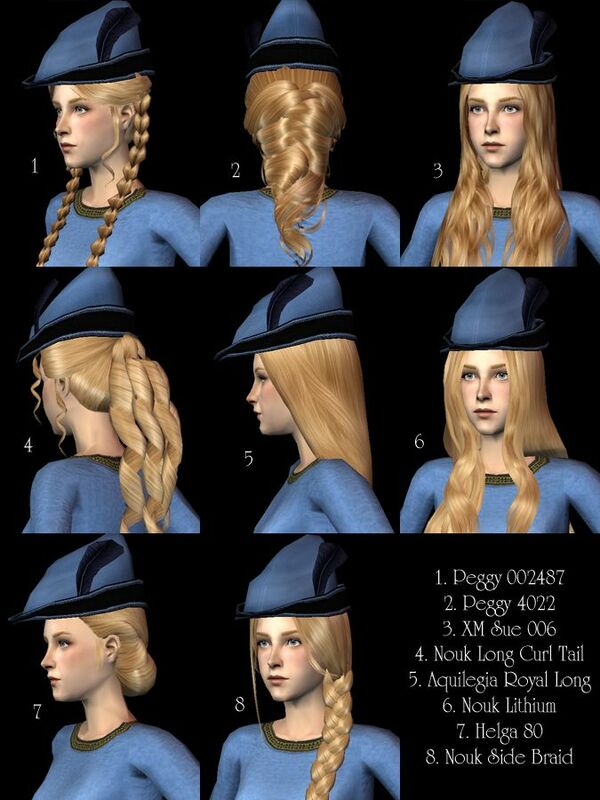 I based these crispinettes on the crispinettes and tressour crispinettes at Kat's Hats, although I kept my cauls finer. It may take me a while, but when awesome, well-mapped hat meshes happen, I do recolor them to the best of my ability. The name of this hair is French for 'this is not a hat.' And it's true, it's not a hat at all! It's a hair, and it's even a hair I've uploaded before. 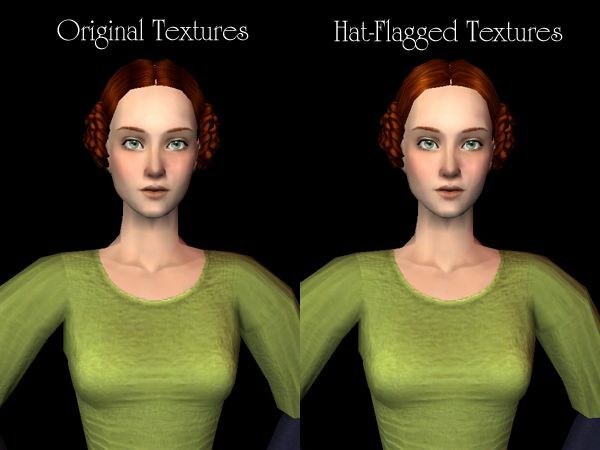 However, not only did I shift the textures around a bit this time, I also made sure this was a hat-flagged hair as far as chemistry goes-- that's right, ensure your ladies are wearing THIS hair under their crispinettes, and their gentlemen (or maybe the other ladies. 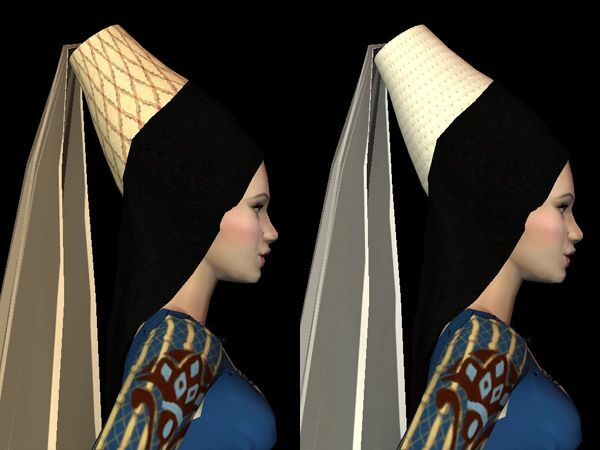 Sims don't limit themselves) will notice their awesome headgear. Comes in two versions, regular and townie-unfriendly, so you can control who seems to be wearing a hat with their braided buns and who doesn't. Okay, you remember when I said Bald of Awesome worked really well for accessories that cover the whole head? Yeah, this is what I was talking about. 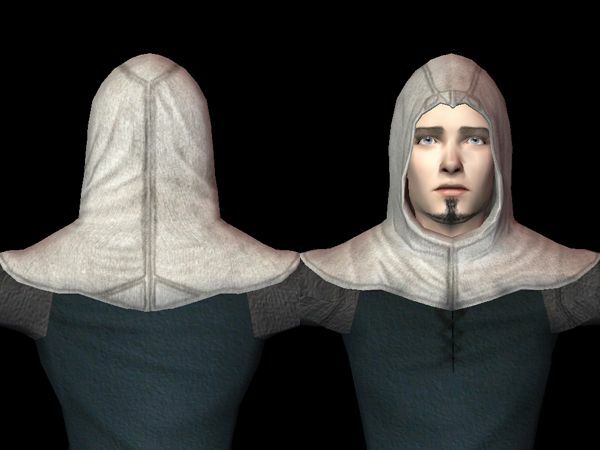 Back in the day, I found myself begging for age conversions of Daislia's Altair Hood, which was incredibly awesome but a little awkward on teenagers (they used the adult mesh and the crown of the head was WAY too high on them). 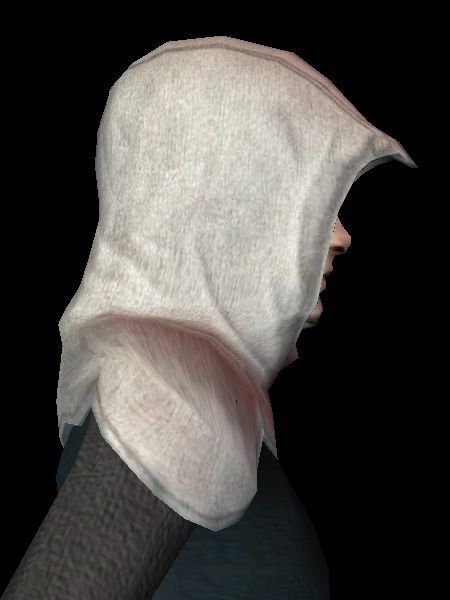 Ja stepped in and turned the hood into an all-ages accessory, which, after a moment's thought, rocked my socks-- eighty-two recolors of a hood go great in my BV Misc Jewelry bin, but less great as multibinned hair meshes. (Because that's how I roll in my own game.) So! As usual you can get this two ways: in the Accessory bin or in the Nose Ring Bon Voyage jewelry bin (apparently I put hoods into the Nose Ring bin. I don't know why; perhaps I'm hoping for a hat or a crown large enough to show through? Ah well, I did it eighty-two times, it's staying a nose ring). This accessory DOES NOT WORK WITH MOST HAIRS. Use it with the hat-flagged Bald of Awesome hairs, any other bald hair that pleases you, or the Seasons Caesar hair. Pretty much anything else is going to clip like a mofo. Have I run out of things to say about this hood? I don't know. I guess I could thank Ja again, and Daislia for her permission to age-convert. 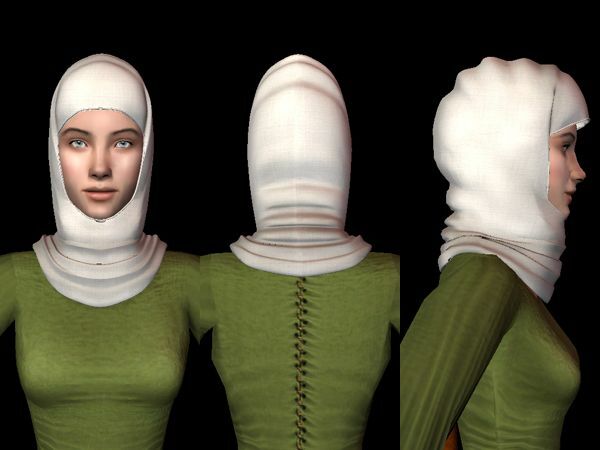 I particularly like these hoods as jewelry because of the ability to set jewelry by outfit. What makes an outfit look as wintry as a hood? Maybe gloves, but nobody's done a glove mesh for all ages and both genders. When somebody does, I'll be all over it. You know, I really hesitated to do these in Pooklet's naturals. I mean, they look great, but they're the same color as the hairdos I regularly put on my Sims' heads. 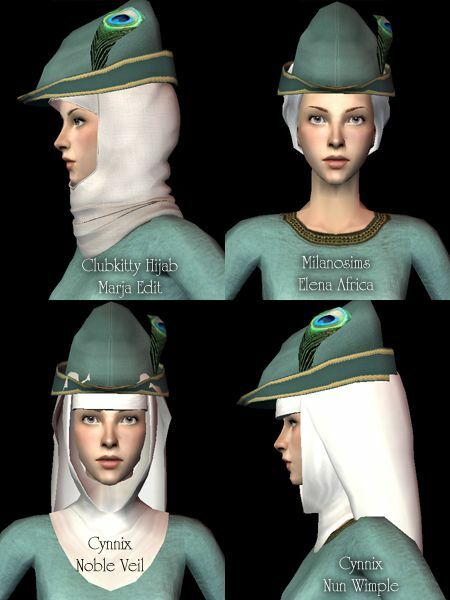 Still, I think it's well worth it for some peasanty-colored headgear. It's really easy to short the peasantry, especially the men. Once again, a hair-covering hat done in a mix of light Project Mayhem and ACYL colors, suitable for fishwives, laundresses, and other such ordinary womenfolk. Still, there are Time Bomb and Milk recolors, so Her Ladyship can cover up her flowing tresses when she's skipping rope or visiting the bathhouse. Because I wanted just-a-veil over just-simple-hair, that's why. The veil is in either CuriousB's Milk or Oyster (I forget which, but it isn't bright white) and is suitable for as broad a class of women as I could manage-- which is why it's solid instead of sheer. Sheer silk or linen was expensive and delicate, and... probably the most common woman who could get away with this hair is a stable farmer's wife with her very best clothes. There is a weird little bit on the top of the head where the hair poked through the veil-- originally the little crown covered that up (but as it's a miniature crown Victoria had made because the full-sized crown gave her a headache to wear, it's definitely out-of-period for my purposes). 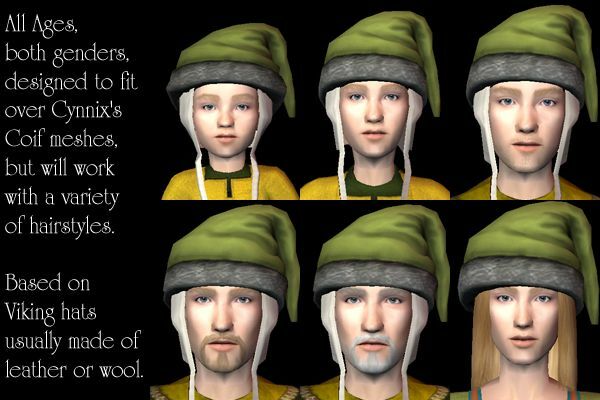 Because my Sims need warm headgear, that's why. Okay, first things first, this is an accessory, NOT a hair. 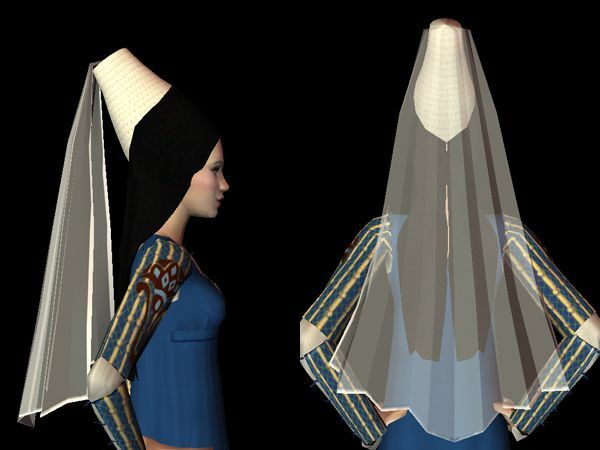 It's shown worn over Cynnix's coif mesh-- it was designed to sit on that mesh-- but your Sims can wear it with any hair that isn't too full (or it'll clip) or too thin (you'll have gaps you can see the wall through). As always with accessory hats, you can download as an accessory or as an Eyebrow Ring in the Bon Voyage jewelry bins. I've credited everyone for their actions, but the downloads are separated by the hat crown colors. This is because most of the fur trim is in Pooklet shades, but now and then some Autumn Chocolate or ACYL Milk crept in. The in-game tooltips show the exact color combinations. Some of the brighter really don't work whether you assume these hats are leather or wool (both were used in this pattern), but you get the full set anyway. If you want to take out Purple Haze, Mauve, Teal, Royal Blue, Kingfisher, or anything else that looks like an analine dye, be my guest-- but they're there if you want them for whatever reason-- I just can't stand not doing a full set. A veil and wimple in the lightest color actions I use (which I believe means Time Bomb, Milk, Oyster, and Primer, in that order) suitable for either your upper-class ladies or those with pretensions to the upper class. 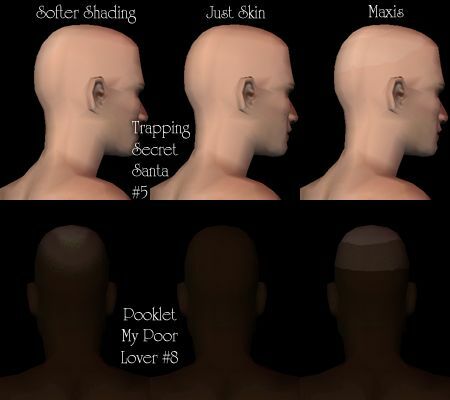 As ever when you can't see any hair, you can grab either the custom or the multi-binned files. ... And this is seriously the only picture I've got. Okay, the main picture is from the front because you get LARGE swatches due to detailed fabrics. AND you get a history lesson! This is a Burgundian or English hennin, as opposed to the French or Steeple hennin, which is the one with the point on top. 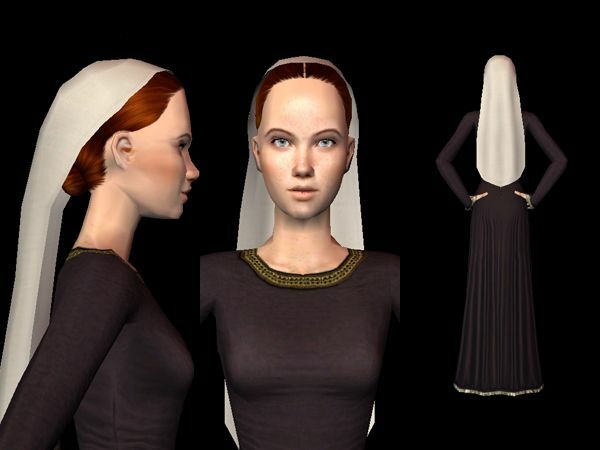 (Oh how I yearn for a properly-drapped steeple hennin for my Sims.) Historical texts say these hennins came in bright colors and rich embroidery, BUT in portraits I have only ever seen one example that wasn't some shade of white, silver, gold, or cream, with the black velvet lappets, so that's what I based my recolors on. Which is nice, really, because that way they go with everything. 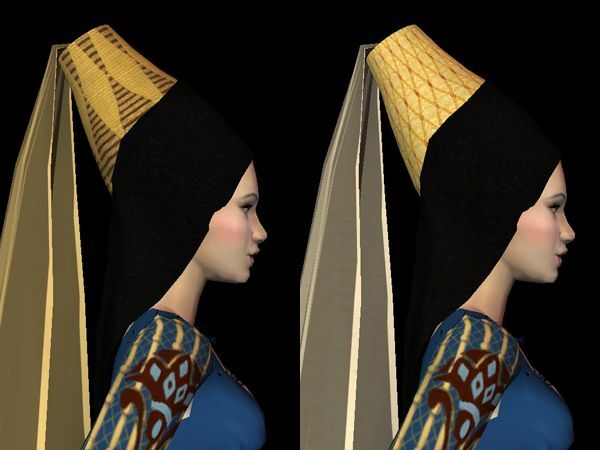 This has actually always been quite a nice mesh; its chief issues were that the veil is draped improperly (see the link to Kat's Hats) and that originally, it wasn't animated. 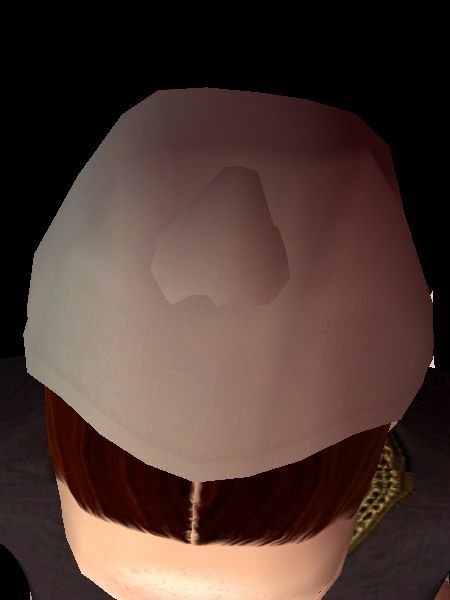 FantasyRogue fixed the mesh so that the lappets and veil are no longer in ur thoracic cavity, breakin ur suspension of disbelief, so I'm happy enough to use the mesh now. 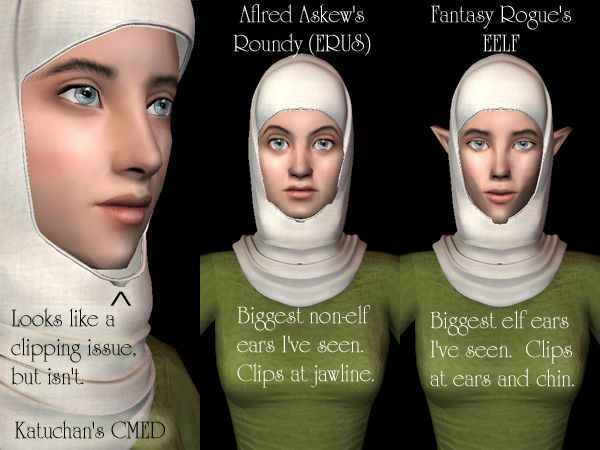 Word of warning, this will clip on Sims with big ears or prominent cheekbones. As ever, you can choose custom or multi for your binning pleasure. You guys thought I was kidding about having a lot of hats in this dump, well, here's the first of eighty-two (uh, technically one-hundred-sixty-four) more. That's right. I am finally living up to my screen name here. Okay, okay, first things first, this is an accessory, not a hair; the mesh is by G-Knee who worked very, very hard on it and is, in general, quite awesome. 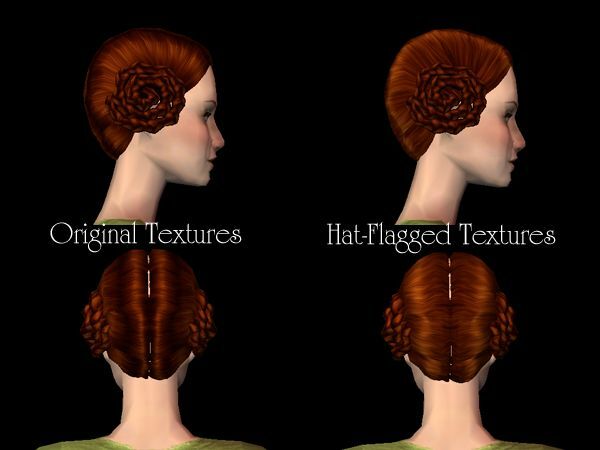 There are technically four versions of each set, because there are two hat meshes-- the high mesh and the low mesh. Why are there two meshes? Well, because some hairs fit under the high mesh better and some fit under the low mesh better. This is a bycocket, and absolutely everybody wore them, from the meanest serf to the wealthiest king, made of leather or wool or velvet, as suited your fancy and your finances. Okay, before I link a whole mess more pictures, let me say again that in each high-and-low set, you can choose between accessories or BV eyebrow-ring jewelry, as you like it. Okay, let's see, more things to say about these meshes. 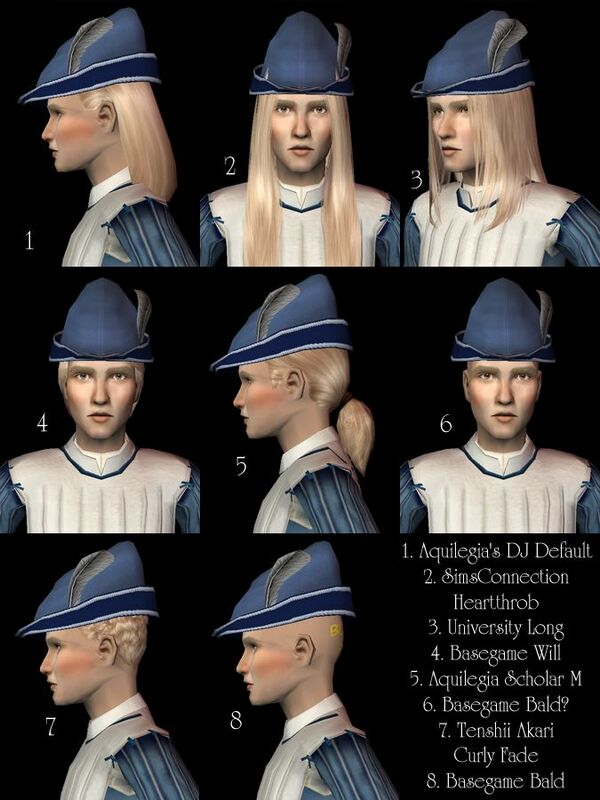 Well, all the swatches are shown with the Low hat on Cynnix's coif mesh, so that's an important thing to know. I like it over the coif because it's accurate (hats were frequently worn over headcoverings like coifs or clouts to protect the expensive material of the hat from hair that might not have been washed in a week or more) and because it gives correct chemistry tags-- but then so would wearing it over Ceci N'est Pas Un Chapeau, really, or over any of the headcloth or veil-and-wimple meshes in this post. The neat thing about the bycocket is that it is completely a hat for all classes, and it had its heyday right smack in the High Middle Ages. 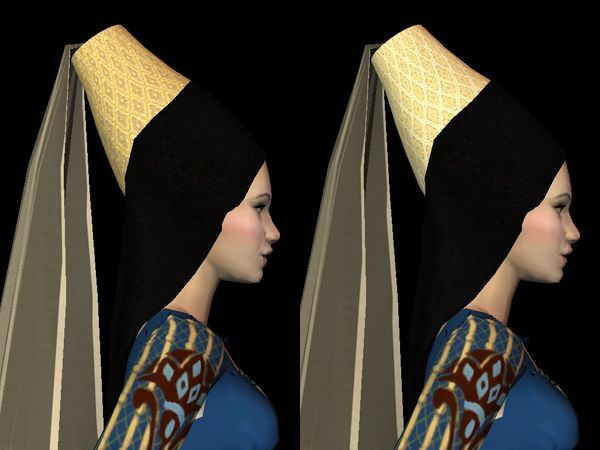 They were popular hats to wear while hunting or sporting, and in fact for women the bycocket was mostly a sporting hat-- worn while practicing archery (one of the few weapons it was at all appropriate for a lady to admit some skill with) or while hawking. As usual, I've included all the colors in all three sets of actions, and I've done my best to give you a variety for all your classes. Some are dressed up with posaments from silberknoten.de, some with ouches that are reproductions of Tudor pieces (copied from portraits of Henry VIII and Princess Elizabeth Tudor, but not impossible in style or composition for earlier periods), occasional peacock feathers, and plenty of trim. 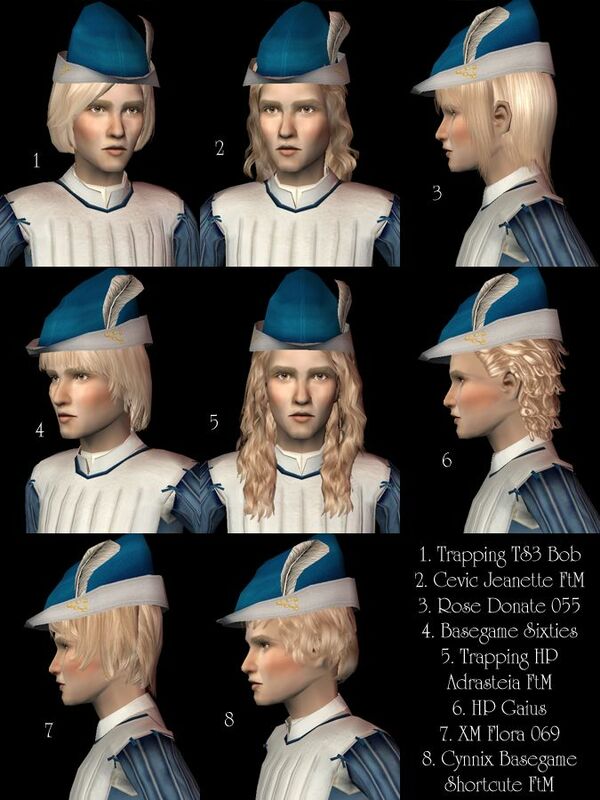 Oh, and there's a set of dresses and tunics coming that coordinate with these hats. So stay tuned for that. I might possibly just finally have enough simple headcoverings for women. ... Not that I'd turn down more, of course; that would just be silly of me. 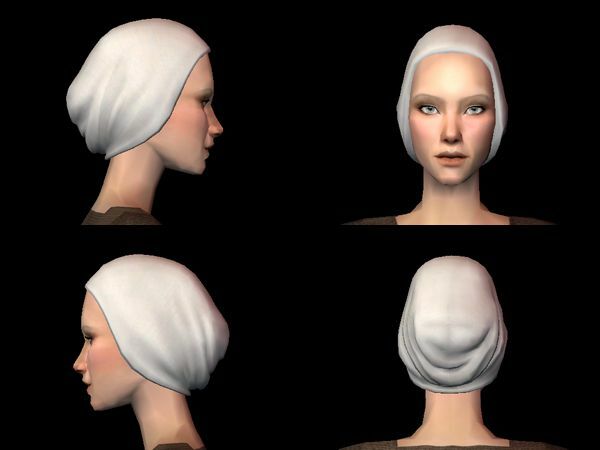 Okay, what we have here is a simple, un-starched veil and wimple (veil goes on the head; wimple goes across or under the chin and around the neck) in a variety of colors from lady-in-waiting white to no-it's-dyed-this-color brown. Remember, back in the middle ages, everybody used linen because it was more hard-wearing than cotton; linen fibers bleach in sunlight when wet and yellow in sunlight when dry, so for the perfect snowy whites, a lady's laundress had to get the linens off the line the moment they were dry. A serf who does all her own washing is going to have yellower headcloths than a lady who can hire out, because she's got a million other things to do while her linen yellows on the line. Once again, I present you with the Custom Versus Multi-bin choice, and by now you know the deal; for post-Seasons games, multi-binned hairs do not mess up your assorted hairstyles for different outfits, while custom-binned hairs show up in Body Shop for all your recoloring needs. Could I just hug you right through the internet? I just really look forward to your hair dumps. I even like reading them even if I don't download some, because your little blurbs are really interesting! Every time somebody says they find my blather about things like fashion and history and fashion history interesting, I get SUPER flattered, so heck yes as far as I am concerned you can totally hug me through the internet, thank you!